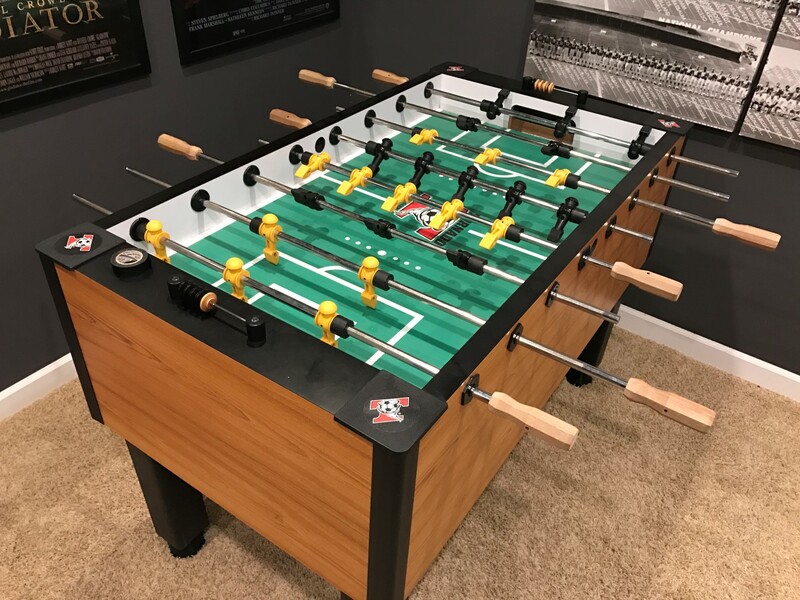 I finally got around to a project I’ve been kicking around for a long time, adding a sound system to my Tornado Foosball table. I’ll probably have more details in a week or so, but for now I wanted to post up the video and some higher level details about the project. UPDATE: Parts for the Foosball Sound System are now listed below. Basically, the way it works currently is that there’s a sound system that plays a constant crowd noise during the game. It’s set to loop every minute or so but it could be changed to be longer if needed. When goals are scored from either goal, a sound gets played. Right now it’s just the same sound every time but that could be switched out to be different every time. I programmed the system to only use the two tracks currently just to make it easier, adding more tracks would require some code changes. Basically, the way it works is the sensors linked above sense when the ball passes the goal. The code on the board then plays the applicable sound from the audio board (one of 9 different sounds). I have it looping through a background sound until a goal is scored, then it interrupts it and plays the goal audio. The audio has to be 8 bit mp3, which is part of the difficulty. I think after doing this version 1.0, version 2.0 would be using a better board with more advanced hardware. The Arduino is capable of doing the job but the 9 sound limit along with the short delay between sounds makes it less than optimal. I actually did a version with songs instead of crowd noise and I think it’s better overall. However, I wasn’t sure if doing the video with licensed music would fly on youtube. I switched it to the crowd noise instead as a result. If anyone is interested in doing this or wants more info, email me at gameroominfo@gmail.com. Previous articleSuper Chexx Pro Bubble Hockey released!